Posted on Fri, Mar 23, 2012 : 4:24 p.m. The Washtenaw County Road Commission will reopen Dexter-Pinckney Road between Wylie Road and North Territorial Road at 7:30 p.m. today. Officials also will open Wylie Road between Island Lake Road and Dexter-Pinckney Road at the same time. The temporary closure on Dexter-Pinckney Road between Island Lake Road and Wylie Road remains in effect, and a detour route is posted, according to Road Commission officials. 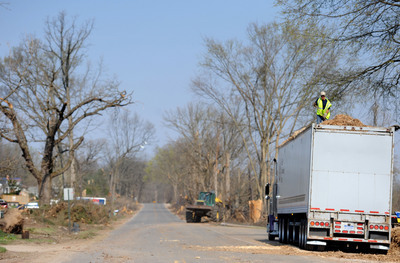 The road closures have been in effect since last week, when a tornado ripped through the Dexter community. Local traffic to and from adjacent properties along the closed section of Dexter-Pinckney Road will be maintained. The detour for the temporary road closure is Island Lake Road to Dexter Town Hall Road to North Territorial Road. Sat, Mar 24, 2012 : 8:12 p.m. When I drove from Inverness area to US 23 on N Territorial, I passed Dexter-Pinckney Rd and there were still roadblocks set up an a police car at about noon today. So, I do not believe it is open from N Territorial to Wylie. Sat, Mar 24, 2012 : 6:21 p.m.
&quot;Officials also will open Wylie Road between Island Lake Road and Dexter-Pinckney Road at the same time.&quot; This is not true, Wylie Road is closed. State Police and barricades are set up at Island Lake Wylie. &quot;The detour for the temporary road closure is Island Lake Road to Dexter Town Hall Road to North Territorial Road.&quot; If Wylie is going to be open and Dexter-Pinckney north of Wylie, then won't people use that instead of going all the way west to Dexter Townhall Rd.? Seems to me, that is what is going to happen. Unless of course they live closer to Dexter Townhall and west.